Skiing can be really pricey, so it’s a good idea to shop around for the cheapest offers. Ski season is beginning in some places, but the snow is still a little too wet for most of us. The Telegraph has a good guide to ski season if you’re interested in doing a bit of background reading. As Brasov has been on the blog recently, it’s perhaps fitting to talk about alternative skiing holidays in Eastern Europe (and it’s really cheap as well!). Let’s look at Romania, Bulgaria and Slovakia. 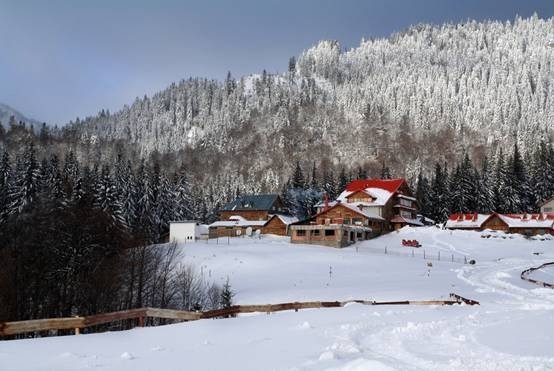 The best thing about a skiing holiday in Romania is that it’s just so incredibly cheap. It’s not what comes to mind when we think of Romania, but skiing is incredibly popular, and you’re not paying the premium prices you would in the Alps. The true Romanian ski season doesn’t start until mid-December, but it’s worth the wait. There are over 30 high-end ski resorts in Romania, each varying in the amount of runs and lifts they have. If you find yourself in Brasov, you can expect to enjoy great food– especially the desserts; read Travels 4 Yum to get a better idea of the pastries, cakes and beers available. Most of the locals speak excellent English, but saying “thank you” in their mother tongue is very much appreciated. It is: ‘Mulţumesc ‘, pronounced mool-tzoo-MESK. Bulgaria’s ski scene has very mixed reviews. Most praise it for the low prices, but the same people also deplore how cramped and overpopulated the slopes are. Bulgaria really is a cheap option, with some hotels charging as little as 59 euros per night. It’s up to you whether you want to risk going at the wrong time and barely having any room to ski. Bansko has the most reputable hotels, restaurants and slopes, so it’s probably the safest bet. The Telegraph has a good guide to skiing in Bankso for you to read up on ahead of making any big decisions. If you do go, the Bulgarian for ‘thank you’ is ‘Благодаря’, pronounced blah-goh-DAH-ryah. Slovakia has very cold weather in the winter. The lowlands see standard temperatures between 0° C (32°Fahrenheit) and -10°C (14°F). In the mountains, it’s even colder and can reach as low as -20°C (-4°F). This means that you should wrap up with multiple layers if you intend to go on an expedition in Slovakia, skiing or otherwise. If you’re going to do a lot of walking or skiing, make sure you get a specialist outdoor coat that insulates and protects you from the wind. Skiing in Slovakia’s Tatra Mountains is another cheaper, cheerful option for any budding skier. There are only a handful of ski resorts in Slovakia, but the low temperatures ensure a long ski season, with some resorts opening in November, such as Jasna-Chopok, and most staying open until April. Slovakian for ‘thank you’ is ‘Ďakujem’, pronounced JAH-koo-yehm. Wherever you end up this ski season, I hope you’ll consider some of the cheaper, less-known Eastern European options. Just remember to wrap up well and eat lots of stews and winter warmers to keep your temperature and spirits high.